In a world of seemingly endless choices, finding the best route can seem impossible. That’s where Panos M. Pardalos comes in. Figuring out how to make things run better, faster and more efficiently is Pardalos’ specialty. His main area of research is in global optimization, a division of mathematics and engineering that seeks to find the best way to carry out some objective without disrupting any other constraints on the system. Within these limits, Pardalos can translate numbers and complex equations into real-life solutions for real-life problems, including increasing production, decreasing costs or, in some cases, saving lives. Recently, Pardalos has applied his research to the medical field. In addition to analyzing information and developing algorithms related to a number of areas in biomedicine, Pardalos has used global optimization to predict epileptic seizures. His research in epilepsy won him the Pierskalla Award for excellence in health care management science. He was also issued two patents in 2007 and 2008 for his work and has several more in process. Pardalos’ research has also been applied to financial and social networks using massive data sets. By developing efficient algorithms for complex problems, Pardalos is also working to make the process of sending information simultaneously to a number of destinations, also known as multicasting, quicker and more streamlined. “Our research goal is to have a unifying theory and develop external memory algorithms for all these types of dynamic networks,” Pardalos said. 2008 has been a busy year for Pardalos. 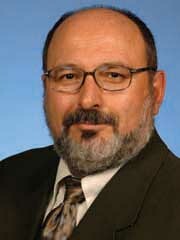 In addition to his position as the editor of the Journal of Global Optimization, he has co-chaired the Eighth International Conference on Cooperative Control and Optimization and the Conference on Computational Neuroscience. In the past year, he has shared his work in London, Paris, Madrid and Rome, industrial and systems engineering Chair Joseph C. Hartman said. “Dr. Pardalos has been, and continues to be, a leader in the field of operations research, with specific applications of global optimization in biomedicine, data mining, and multicast networks,” Hartman said.